Heat oven to 350°F. Grease bottom and sides of 2 (9-inch) round cake pans with shortening, or spray with cooking spray. In large bowl, stir together cake mix and gelatin mix with whisk. With electric mixer, beat in pureed strawberries on medium speed. Beat in eggs one at a time. Add oil and water; beat about 2 minutes or until smooth. Divide batter evenly between cake pans. Bake about 30 minutes or until toothpick inserted in centre comes out clean. Cool cakes in pans 20 minutes. Carefully invert cakes onto cooling racks. Cool completely, about 45 minutes. Refrigerate cooled cakes 4 hours or overnight to make icing the cake easier. Place 1 cake, right side up, on serving plate. Spread frosting on top of cake. Place second cake layer, upside down, on top of frosted cake. Spread frosting over top and sides to completely cover cake. (You may not need all of second container of frosting.) Garnish cake with fresh strawberries. To keep your serving plate clean and frosting-free, place two strips of waxed paper side by side on top of serving plate and beneath bottom cake. Pull waxed paper out from opposite sides of cake once frosted. 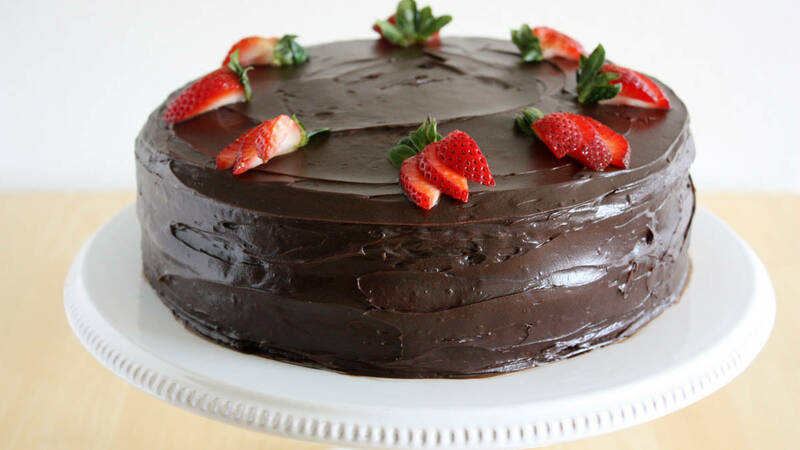 Place chocolate-covered strawberries on top of frosted cake for an even prettier (and apropos) presentation.